This is the total demand in the economy. This is the total supply in the economy. It is initially flat due to the ability to employ more resources (labour) and increase supply. It becomes steeper & then vertical when the economy reaches full employment which means we cannot increase supply. 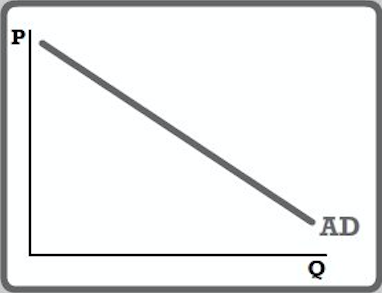 Figure represents a simplistic model of an economy. Imports represent money leaking out to other economies. Taxation removes money from households and takes it out of the economy unless the Government spends it. Savings by households represent money taken out & stored by banks (although its often lent for investment). Capital investment by firms (often borrowed). Full employment: having all the people who are able to work and looking for work in employment. Usually there will be some frictional unemployment existing. Price stability: governments aim to keep inflation at a steady rate (around 2%). This allows firms and individuals to plan for the future more accurately. Economic growth: increasing the output of the economy (Real GDP). In the long run they aim to push the PPB (Production Possibility Boundary) outwards. Redistribution of Income: governments may aim to take money from the rich (through higher taxes rates) and give it to the poorer population (through unemployment and social benefit schemes). Balance of Payments stability: keep imports and exports balanced swell as flows of finance. 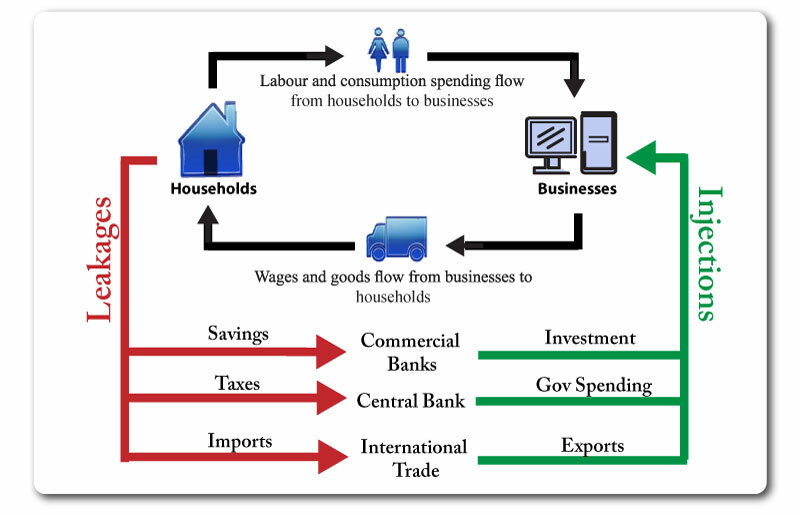 Governments may provide goods/services that are a natural monopoly (water/electricity). Essential goods such as health care, education and police forces are often provided by the government. Governments may provide merit goods such as public swimming pools, libraries and sports centres. The government employs people in public sector jobs such as teaching, police and fire services, doctors, nurses and military personnel. Through its employees it can set examples of good practise and restrict wage increases to limit inflation. The government can also increase or decrease its number of employees to manipulate unemployment figures. This focuses on controlling changes in the money supply, interest rates & exchange rate. Money Supply: changed by printing money & encouraging/discouraging lending by commercial banks. 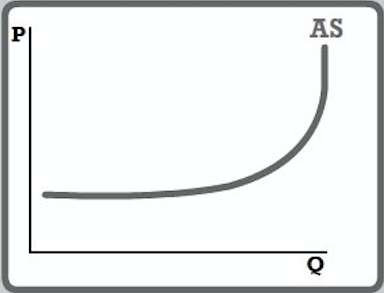 Increased money supply = Increased Aggregate Demand (AD). Interest Rates: Central Bank raises or lowers these. Raised interest rates make saving more attractive and borrowing more expensive. This should lower AD & therefor firms are also likely to invest less. Exchange Rates: these can be fixed to another currency (dollar) to control inflation or they can be floating. Contractionary Monetary Policy: raising interest rates and reducing money supply to reduce AD. Expansionary Monetary Policy: reducing interest rates and increasing the money supply to increase AD. This focuses on changes in government expenditure and taxation. Government Expenditure: increases in spending will increase AD, decreases in spending decrease AD. Taxation: increases in taxation will leave people with less money to spend & so reduce AD. Budget: the government has a surplus when it takes more money than it spends & a deficit when it spends more than it takes. Reflationary Fiscal Policy: increasing gov spending and reducing taxation to increase AD. Contractionary Fiscal Policy: reducing gov spending and increasing taxation to reduce AD. Getting rid of red-tape and bureaucracy – oftentimes firms produce less than they ought to because they have so many forms and rules they have to follow. Getting rid of these makes it faster to produce, saving time and money. Reducing the power of trade unions – trade unions keep wages high. Wages are a big part of a firms’ costs of production. If trade unions were made less important, firms could spend less on their workers by reducing the wage. Changing laws and legislations – if previously firms were only allowed to supply a certain amount, then when this is changed they are free to produce more. Reducing taxes on firms – this allows them to produce more at the same price. Investment in healthcare – this makes the workforce able to produce more as they are healthier. Research and Development – can lead to new ways of doing things, or the discovery of new production techniques like genetically modifying crops. Investment in technology – combine harvesters do a lot more work, at a faster rate, than humans. Car plants in Tokyo are now almost all totally automated. Subsidizing entire industries – this allows firms to spend money on the above, or to buy more factors of production which make them more productive. To reduce income inequalities - we can take from the rich and give to the poor. Indirect tax – a tax paid on the value of a good or service. For example, if you buy a meal at a restaurant, you will have to pay for the meal and for a tax (of around 13%) on the value of your meal. This is known as Value Added Tax (VAT). With a progressive taxation system, citizens are put into ‘income earning bands’ and charged taxation according to these bands. The higher your income, the greater percentage of taxation that you need to pay on income in a particular bracket. Regressive taxation is the opposite to progressive taxation; the higher your income, the less percentage you pay in tax. Once again, citizens are allocated a tax band and must pay accordingly. In this case, citizens pay the same percentage in tax, regardless of their income. There are no tax bands – everyone pays the same % - for example 10%. If you earn $100 a year, you thus pay $10. If you earn $100 000 a year, you pay $100. Again, note that the amount each person pays is different but the percentage is the same.